Battle Baptists goalkeeper Jake Rudwick played a starring role in last weekend's win over Eastbourne Rangers. Battle Baptist Football Club is gunning for a place in the semi-finals of the National Christian Cup. The Macron East Sussex Football League high-flyers will welcome semi-professional outfit Cleanslate FC, of Milton Keynes, to Battle Rec in the quarter-finals today (Saturday). Kick-off is 2pm. Battle recorded convincing victories in the previous two rounds, winning 5-0 away to St Albans Romans (Herts) in the last 16 and 4-1 away to St Mary’s West Croydon (Surrey) in round two. For their part, Cleanslate were narrow 2-1 winners away to Christians in Sport (Luton) in round three following a second round walkover. At stake for the winners is a home semi-final against Christ Central (SE London) or Ruislip Baptist (Middlesex). Battle will go into the game in good heart following a 4-1 win away to league rivals Eastbourne Rangers in an ESFL Premier Travel Challenge Cup quarter-final last weekend. 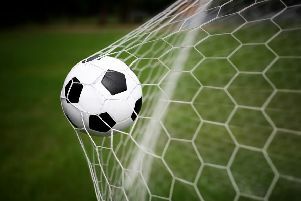 A Glen Carrick brace and an outstanding display of goalkeeping by Jake Rudwick helped Baptists set up a semi-final away to Sedlescombe Rangers. Although Battle dominated possession in the opening 15 minutes, Eastbourne should have opened the scoring. Rudwick made a stupendous double save, the second with his legs, before the Rangers forward ballooned a third opportunity over the crossbar. The home side were to rue the miss as, moments later, their defence misjudged a long clearance which released Battle’s Dean Boyd, who crossed for strike partner Finlay Garlick to control the ball and drill into the net. Rangers put the Battle goal under periods of pressure and miscued several chances from the edge of the box, while Garlick pushed a one-on-one with the Rangers goalkeeper wide of the post on the counter-attack having been put in by an outrageous rabona pass from Boyd. The Baptists finished the half strongly and grabbed a second when Carrick charged down an attempted clearance before bundling the ball over the line via a tackle with another opposition player to give Battle a slightly undeserving two-goal lead at the break. After half time the Baptists didn’t help their cause by conceding a series of free kicks, one of which was met by an Eastbourne head only for Rudwick to make another outstanding stop as he palmed the ball onto the bar, and watched as it bounced down onto the goal-line and out to safety. At the other end, Boyd shot against the goalkeeper’s legs when put clean through. The match-clinching third for Battle came when Harry Loates and Boyd combined skilfully on the left to work a cross that neither Garlick nor Carrick could force in initially, but a spill by the Rangers goalkeeper allowed the determined Carrick to score his second at the next attempt. Battle won back possession and Adam Higgins-Gooch sprayed the ball wide to Loates, who burst past his marker before burying a confident finish into the bottom corner. There was still time for an Eastbourne consolation when a wonderful pass put the Rangers left winger through to cross for their striker who finished, despite the best efforts of Rudwick and Scott Vickers on the line.